Skiing in Oberstdorf, Bavarian Style! A ski course at the Alpin Skischule Oberstdorf provides beginners and experts alike with the best pathway to making the most of their ski holiday. 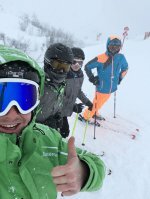 We offer courses tailored for every level of skier with fantastic 3 and 5 day packages available that let you focus on having fun. We also have comprehensive ski rental facilities available for all our customers. Procedure: We meet at 9.00am at our ski school in Oberstdorf directly opposite the train station or at 9.30am in the rental centre of the Alpin Skischule Oberstdorf at the Söllereckbahn. Your ski lessons take place from 10am to 3pm - including a common lunch hour. The choice of the ski group is internally discussed with the instructor.